3W Clinic Translucent Loose Powder(Formerly known as DoDo Palgantong Powder) Dodo Company, the manufacturer of Palgantong has changed its name to 3W Clinic since 2009. ALL NEW versions of palgantong powder now use the name of 3W Clinic .This is the professional version used by professional backstage make-up artists and are imported directly from Korea. PALGANTONG was first launched in Korea in 1999. It is very popular among Korean Movie Stars and 4 out of 5 Korean ladies have tried this amazing power. It was only introduced to professional make-up artists, such as those who worked for Korean TV broadcast stations like SBS and KBS. In 1989, more professional make-up artists started to use the theatrical powder. 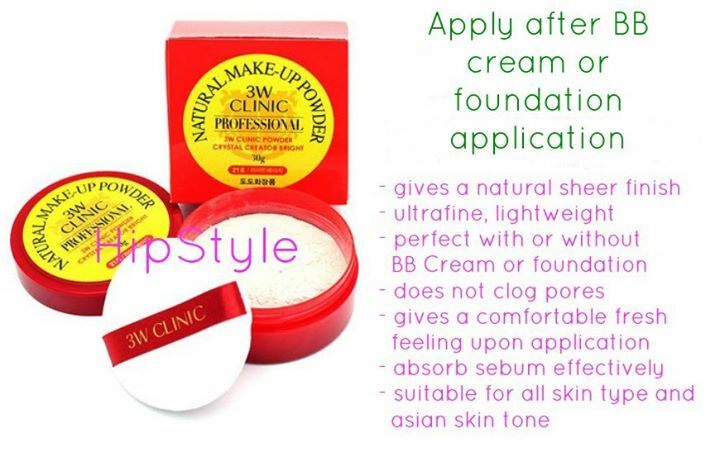 The 3W Clinic Professional Natural Makeup Powder is a very well known product to entertainers. Some fair/white skinned asian women tend to look more chubby and fleshy during photoshoots. This is why Korean actresses depend on this powder to give them better results in front of the camera. Since 1999, this best hit product has been selling well to non-entertainers too. It is now the best selling powder in Korea, Japan and Hong Kong. A record 600 million sold from 2002 to 2006 in Japan's critical cosmetic market. Therefore, it was selected as Japan’s Top Hit product and secures the 1st selling position in Japan's loose powder section. Blooming Effect : The scattering effect of the light-scattering powder creates bright and splendid skin. #21 - Light Beige is Light color for fair skin. Recommended Use:After your last step of the skin care, take appropriate amount of SunBlock or BB cream and apply evenly on your face or on targeted areas.Next, adjust amount of powder with puff inside, and follow with a light layer of "Palgantong Powder". If you want a "dewy" effect (rather than cover), then apply transparent pearl. Besides facebook shops I have also seen this being sold in ebay. I am not sure where to get them in Manila though because as far as I know it is just being sold online. Yay it is big! It is red, yay professional? Haha. Well the packaging is simple, made of plastic and safe for clumsy gals like me. It's big and quite bulky but I love it. Yay well 3W Clinic Professional is indeed living up to its hype. It is comparable to Eshiko which is another popular finishing powder but has a steep price. I am thinking of having a side by side comparison review next time. It does soften the look of the pores but not totally diminish it. I like the scent of this powder, it's really girly, though usually I like scentless powders better. It's understandable that it gives no coverage since it is a finishing powder but it has subtle color which doesn't really show once applied. Based on other online reviews there is not much difference on shade # 21 and 23 although some of them says that shade # 21 is for fair-skinned girls with pink undertone while the other is for yellow under tone. On swatches there is not really too much difference. I am curious on Shade# 10 which is suppose to give the dewy effect. Okay going back to their promises, is this powder giving the effects promised? Slimming and long lasting is not in my list. I can't see much difference on my face but maybe because my face is already slim to begin with? Hmm~ I dunno. I find that this powder does not control oil but it looks okay but not dewy like mineral make-up after melt effect. I can agree that it does give the blooming effect upon application. It's just fresh and natural. I can't attest to the super hydrating effect, I still moisturize before applying this. I really don't believe that a powder can hydrate the skin but it is not a really dry type of powder. It's somehow soft and creamy and applies like a dream. Works great on top of bb creams and powder foundation! Floral scent not over powering. Shade is #21 but color is not really evident when worn because it goes on translucent. Best finishing powder I've tried so far! Everything on the box is in korean except the product name itself. Hooray 3W Clinic Powder is super sulit! :) I never really paid attention to the importance of finishing powders until I have used this powder. A tub contains a lot of product and you'll only need a bit of it for every application. I am pretty sure I would be using this for months. To end this post here is the worldwide trending music video of Crayon Pop: Bar Bar Bar.